Soren Petro has seen just about everything the Kansas City sports scene has to offer. A longtime host, who was even a part of the first sports radio show KC had ever heard in the early 90’s, Petro’s opinions on the teams in town have been heard for the better part of two decades. But as much as he’s seen, it’s an interesting time right now for sports talk in Kansas City. Excluding Patrick Mahomes, two of the biggest names in the area have found themselves surrounded in controversy. Bill Self, head basketball coach at the University of Kansas, and his knowledge of the FBI investigation that has rocked college hoops has been a huge local story. The other big one is Chiefs wide receiver Tyreek Hill after he was investigated by police for an alleged battery that he has still not been charged with. They may help with content, but both of these stories still have a relative amount of unknown information and anything new can be hard to come by. This can make it tough for a host. So how has Soren approached this unique time for the Kansas City market? The proud Syracuse grad and host of The Program on Sports Radio 810 shared his thoughts. TM: We haven’t heard any more on Tyreek Hill in like three weeks. How are you talking about this story when there’s been no new information? SP: The Tyreek Hill story is interesting but there’s really not much to say. It gets brought up as, hey, let’s talk about NFL Draft, wide receiver is something they might need because we’re still unsure about Tyreek Hill. From the standpoint of the story being an unknown, it’s a topic because of the Draft and the Chiefs offseason is a very big part of our conversations. But as far as talking about the standpoint of him going to jail, not going to jail, or if he’s going to get released, that’s in a holding pattern right now. I do think that as every day goes by, it’s more likely he’s going to be a member of the Chiefs. I think if something obvious was there, we’d know and a decision would have been made. In terms of the story, we update it around the Chiefs conversations we have, but for the most part, if you’re one that say you know what’s going on with the story, you better or you’re just lying. TM: Are the conversations about Tyreek Hill like: Hey, let’s pretend he’s on the team, who are they going to draft? Or, hey he’s not on the team what do you do now? SP: Yeah, he was just such a lightning rod topic when they took him in the 5th Round three years ago. That dominated the talk about the time and it just re-ignites the conversation. By all accounts, he was doing everything he was asked to do, in terms of counseling and being the model teammate, so there was a feeling those problems were in the rearview mirror. It’s one of those topics that isn’t just a sports radio topic, its real life. That gives everyone a chance to have an opinion. It’s an all-encompassing topic, but it’s just at a weird time so you’re in a holding pattern, trying to make some context to what hearing nothing exactly means. TM: The way you’ve approached the Tyreek Hill story, is it similar to the way you’ve approached the Bill Self story? SP: Yes and no. In some ways, yes, there’s things we don’t know. The difference is that this story while Bill Self is having to be in front of the media on a regular basis. He had to answer questions after each game, he had to answer questions on the Big 12 conference call and had to his radio show. From that standpoint, you were always able to get comments from the ultimate decision maker. 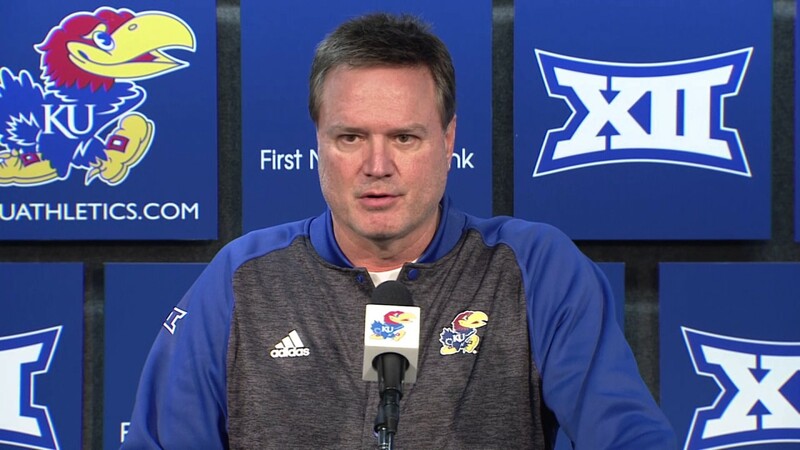 First, we hear KU’s name mentioned with the story, then we hear there’s a trial, then we get the trial and everything that was submitted with it, so there was always new info coming out to where you had new questions for Bill Self to answer. The NFL is about as closed down as you could possibly be in season. Out of season, you wouldn’t even know the organization exists in the town. They just go away, so there’s nobody to speak to and all you get is a statement from the team. Self was actually up there answering questions. It shouldn’t come as a surprise to anyone that Chiefs talk is as hot as it’s ever been in Kansas City. With the best young quarterback in the game, leading the most exciting offense in the league, if you’re not dedicating a whole lot of time to the Chiefs, you’re doing your show a massive disservice. But KC isn’t just an NFL town. It’s been a baseball town with the Royals winning the World Series in 2015. It has a strong college basketball presence with a blue blood program being just 45 minutes down the road in Lawrence. It also has strong college football interests with local teams such as KU, K-State and Mizzou competing in the Big 12 and SEC. Nobody who has any sense about sports radio would argue that the Chiefs aren’t the No. 1 story in town, even in the offseason, but what’s the balance? TM: It’s the NFL off season right now, but the draft is quickly approaching. What’s the balance between hitting Chiefs talk along with everything else going on? SP: I would say the Chiefs moved to the No. 1 story in town the night they drafted Patrick Mahomes and it’s been that way ever since. Each step of his career has been a massive story from when he got picked, when he first got to play and then when he eventually became the starter. I’ve been doing sports talk long enough to remember when the Chiefs came back to prevalence in the early 90’s. They were the dead franchise and the Royals were all the conversation. The Chiefs are bigger now than they’ve ever been and it’s because of one guy and the expectations surrounding him. We’ve never been like this, but I think you can do a show, even out of season, that’s 90 percent Chiefs. You’re not going to upset anyone right now by doing it, but you do have to find a balance. If you’re doing two hour show, you’re going to play the hits, so you’re going to hit more Chiefs. If you do four hours, like I do, we’re doing at least one hour of Chiefs every day and some days even more. Recently, the Chiefs have been 50 percent of our conversation and the other teams have filled in the rest. I’ve never been a big believer in golf talk on a show. Not only do I think interest for the sport has significantly fallen off, it’s just not as easy subject to make interesting on the radio. I can understand the importance of The Masters and the storylines that surround it, so I know talking about it this week makes sense. So, with Tiger Woods shooting for his first major since Elin Nordegren chased him out of his house with a golf club in 2009, do you commit a lot of time to the tournament if you have other relevant stories in your market? TM: First, would you say you’re a golf fan? SP: No, I watch the four majors, but I’m not the one at the station breaking down different swings, identifying the up and comers or anything like that. That’s just not really me. TM: How much time will you commit to The Masters? SP: Our afternoon guy has a cool tradition. He goes to a certain bar and restaurant in town that has three locations in town. They do a remote on Thursday there and at a different one on Friday. They do all these specials and they’ve become the spot to go and watch The Masters. They kind of take over his show with it, so it’s a little bit different in my view. One, I’m not the golf expert and I never try to be something I’m not. When I know we’re going to be pumping four hours of golf in the afternoon on Thursday and Friday, I feel like it’s my job to service everything else that’s going on. We have the leaderboard updates with Westwood One, so it’ll get mentions along with if something just really big ends up happening.